There are multiple airports in Los Angeles that you may be able to fly into for the conference. Check out the options below to ensure the best rates. Please note that Los Angeles traffic is very heavy at most times of the day throughout the year. If you are driving yourself, you are encouraged to check the current traffic in order to find the least congested route to the hotel. 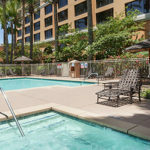 From John Wayne Airport (SNA), 12 miles to hotel: Take the CA-55 N ramp toward Anaheim. Merge onto I-5 N toward Santa Ana. Exit Chapman Ave, EXIT 107B. Keep left to take the Chapman Ave W ramp. Turn left onto W Chapman Ave. Turn left onto Harbor Blvd. From Long Beach Airport (LGB), 17 miles to hotel: Take I-405 S to CA-22 E toward Garden Grove. EXIT 12A toward Harbor Blvd S. Merge onto Trask Ave. Take the 1st left onto Harbor Blvd. Make a U-turn at Chapman Ave onto Harbor Blvd. From Ontario Airport (ONT), 35 miles to hotel:Take CA-60 W to CA-57 S. Exit Katella Ave, EXIT 2. Turn right onto E Katella Ave. Turn left onto S Harbor Blvd. 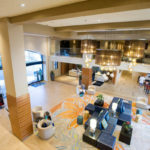 From Los Angeles Airport (LAX), 36 miles to hotel: Take S Sepulveda Blvd/CA-1 S toward I-105. Merge onto I-105 E toward Norwalk, to I-605 S, to the CA-91 E, to I-5 S toward Santa Ana. Exit Harbor Blvd S, EXIT 110A, toward Convention Center. Merge onto S Harbor Blvd. 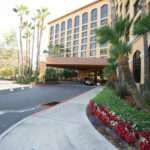 From Bob Hope Airport (BUR), 42 miles to hotel: Get on the I-5 South. Keep left to take I-5 S toward CA-60 E (Pomona). Take the Harbor Blvd S exit, EXIT 110A, toward Convention Center. Merge onto S Harbor Blvd. *Note: Taking Uber or Lyft for taxi services in and around Orange County/Los Angeles areas may often pick up much quicker than traditional cabs. In order to use these services you must download the app on your phone. These services allow for the drivers to be paid through the app so you will not need to exchange money with the driver. Please note that if you hire Uber or Lyft to pick you up at the airport, you will be required to meet them in the departure areas (could increase walking distance). Car rental locations will vary based on which airport you choose for your flight. If the car rentals are not located in the airport, they have free shuttle services to their location. Please note that some of the airports above are small and may not have the car rental company of your choice so do check first.